The following are the jntu kakinada previous question papers for B.Tech 1-2 R10/R13 Regular/supply examinations which are held in the month of August-2014. The Supply examinations for R13/R10 B.Tech 1-2 are going to be held from 1602.2015 on words. Here are some useful previous question papers for u.
jntumaterials.in prvides all jntu materials,previous papers, lab manuals,e-books and online bits for your jntu examinations. Here you can also find preparation planes for the same exams. So, stay with us for all jntu related stuff. 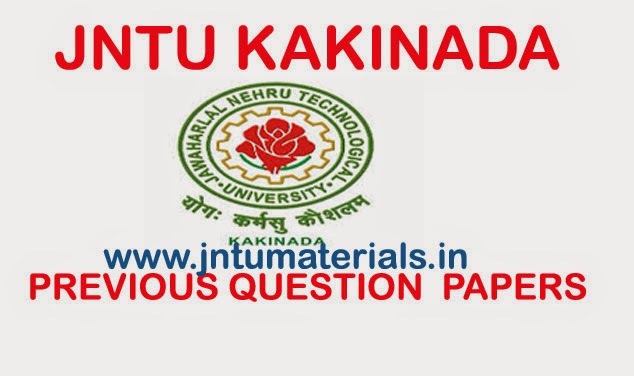 Here are the jntu kakinada previous question papers of B.Tech 1-2 R13/R10 Regular/Supply exams.